Working on a Superyacht as a Steward/ess is becoming the career path of choice for many who would prefer a job at sea to one on land. It’s a perfect way to combine work and travel, you will spend all of your time in the sunshine and in some of the most beautiful places in the world. If you have ever considered a career as a Steward/ess on a luxury yacht, then Flying Fish will help you to achieve your goal. Working on a Superyacht will be rewarding and will take you all over the world. Crew are required to to work hard, be away form home for long periods, and have exceptional customer service skills. The yachts recognise your commitment and the pay reflects that commitment. A Steward/ess starting out in the industry can expect to earn €2,000 to €2,500 per month. If you are a UK resident then your salary is tax free. Land a job on a charter yacht and assuming the charter guests have a good time then it is customary to receive a tip. You are likely to earn an additional €1,000 to €3,000 per charter (usually one week) depending on the size of the yacht. It is common for crew to earn €20,000 to €30,000 in tips per season (May to Sep) on top of your salary. What is life like onboard a Superyacht? A Superyacht is the pinnacle of luxury and extravagance: the yacht is built to each owner’s specifications and, in this industry, you will find that money is no object. Due to their size and complexity, the yachts require a qualified crew to operate and look after them 24/7. All the crew live, eat, work and sleep onboard. Your working day will typically start at 8am and finish at 6pm. When on charter, or if the owners are onboard, then there are no set working hours. You will share a cabin with another Steward/ess. What qualifications are required to work on a Superyacht? All crew working on large yachts are, at a minimum required to complete STCW basic safety training, as well as hold an ENG1 medical certificate. Both STCW basic safety training and the ENG1 medical are mandatory. Those are the formal qualifications, then there are skills needed to work as a Steward/ess. If you have a background in hospitality then this will be valuable to your new career. Any hospitality experience will be useful, however, the skills needed onboard a yacht are slightly different from those used on land so our Superyacht Steward/ess course will improve on what you have learnt. If you are new to Superyachts then the Steward/ess course will give you the skills you need and give you a leg up on everybody else who does not have experience. Superyachts come in all shapes and sizes. A lot of our graduates will end up on a 30m yacht. If on a smaller yacht then you may be required to drive the tender and jet ski or even spend time on the bridge helping with lookout duties. All our Deckhand or Steward/ess courses include Powerboat and Jet Ski (PWC) training. Kelly completed our Steward/ess course in September 2018. She decided to move from a career in the sky as an air-stewardess to one at sea. The day after completing our Steward/ess course she has landed her dream job via Facebook. 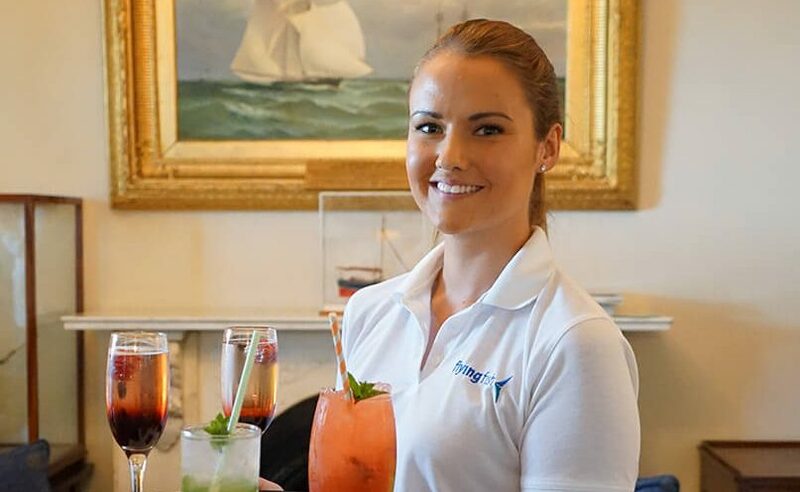 Read Kelly’s story and why she decided to become a Yacht Stewardess. This is the whole reason you are reading this; find a job on a Superyacht and start a new career at sea. Part of our Steward/ess course focuses on careers advice. In fact we now spend a whole day looking at the industry, paying tax, getting that first job and your CV. We will help you write a CV and as we have met and trained you we can provide that all important reference telling potential employers why they should employ you. Flying Fish have seen great success over the 11 years we have been running Steward/ess training courses, with 95% of customers now working in the industry. Flying Fish deliver regular recruitment days in Antibes, France for all graduates of our Superyacht Deckhand and Steward/ess courses. The day is exclusively for Flying Fish customers. It is designed to complement our course delivered by our industry expert who works for a major recruitment agent in France. The day provides the additional knowledge you need to start looking for that dream job. If you already have STCW and want to know the role of a Stewardess.